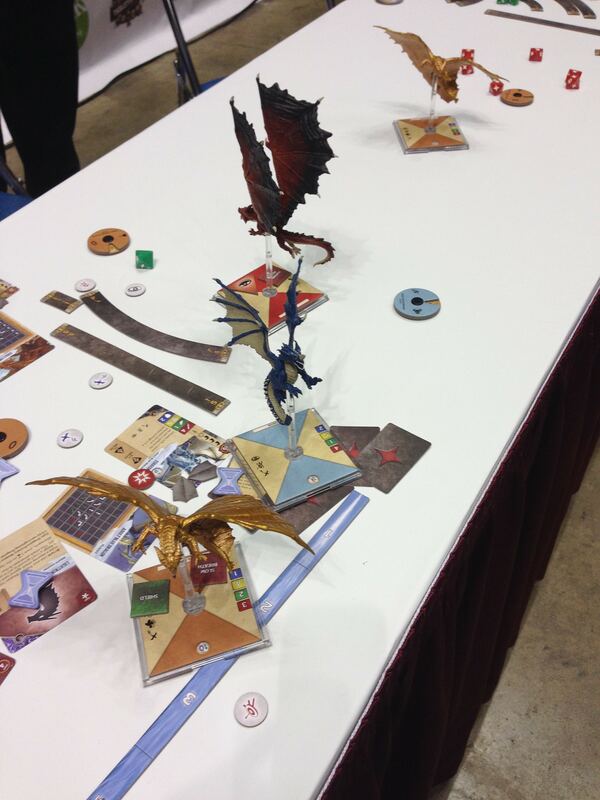 Gencon 2014 enters history and I once again survived four marathon days of gaming glory. This report will focus on the games I played and some the trip itself. Future entries will focus on the vendors and products. 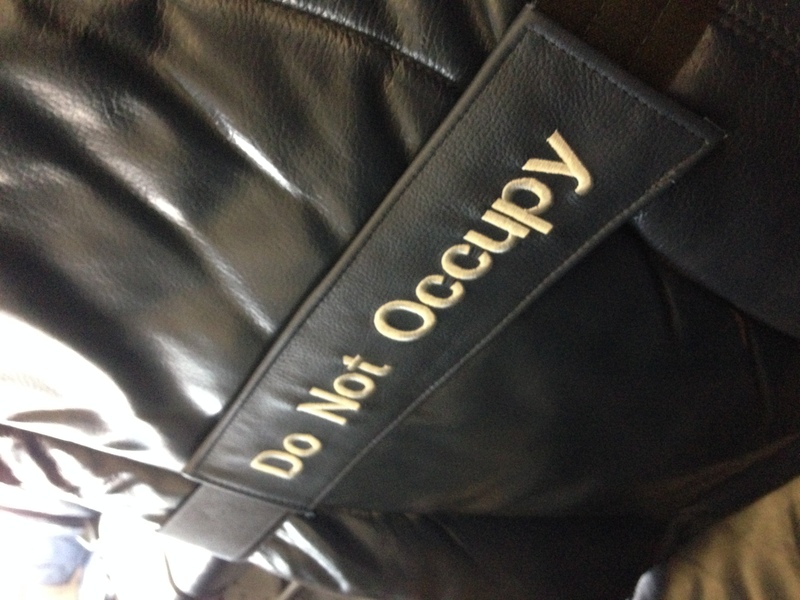 After an inauspicious start to the trip, as seen in the picture below of my supposed seat, we got on the flight and made an uneventful trip to Indianapolis. Though I did see a Sasquatch attempt to eat Will Wheaton at baggage claim. 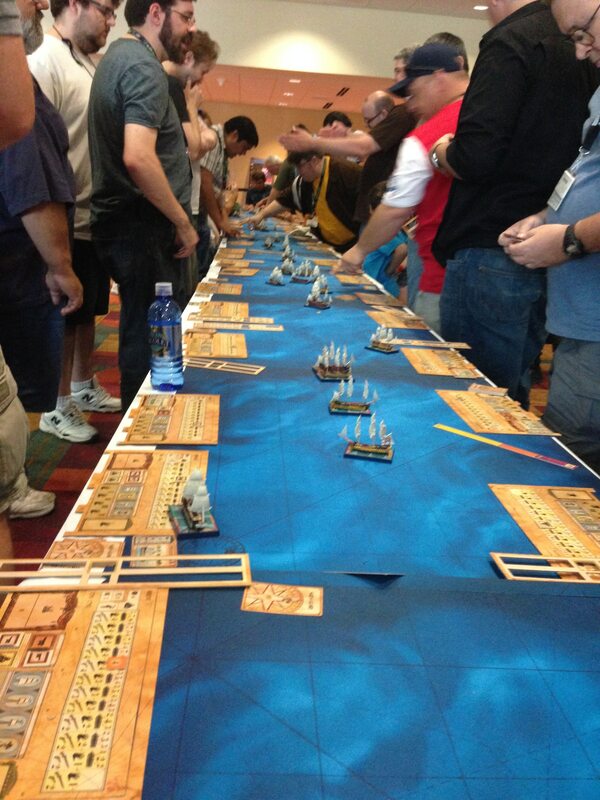 Jet-lagged Thursday kicked off with a “Sails of Glory” world record attempt. 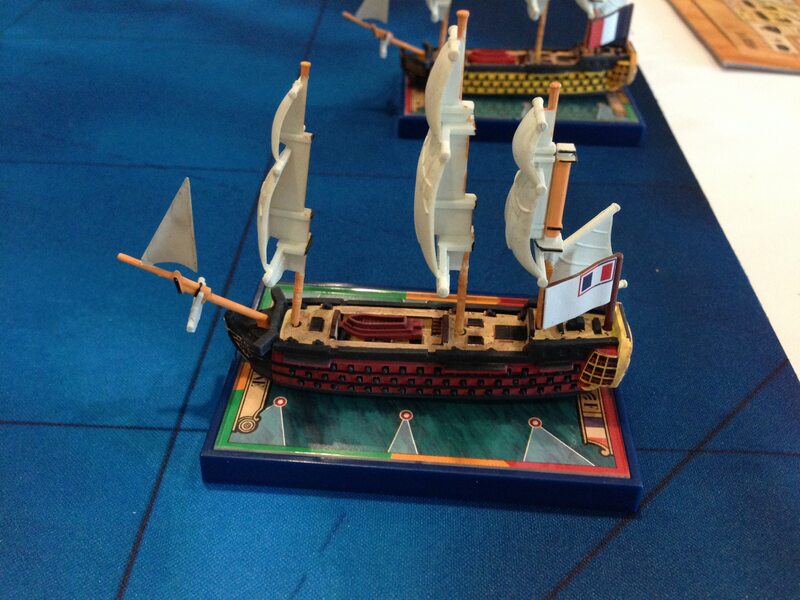 SOG uses uses mechanics similar to “Wings of Glory” and “X-Wing” to maneuver sailing ships in a fierce cannon battle. We used a limited rules set, but the huge battle was a lot of fun. I lost, but at least I did not go out first. My friend earned that honor and received his just reward; a $10.00 for the Ares booth. After my less than stellar performance as a naval commander, I became France’s leader and slogged through brutal realpolitik in Diplomacy. After an early game trust issue with the Italians that lost Marseilles I rallied and by the end of the game was in third place. Most importantly, the Italians faced extermination at my hands. Mmm, revenge tastes like pasta. The players with one exception were my regular group and all old and married and long past such things, watching this guy ram his head repeatedly into a brick wall was a nice bonus to the game. Well done GM, Casanova was a tool! Casanova aside, we beat down the module like a narc at a biker rally. The GM was a bit surprised, but we already knew the system and have been gaming together for a long time, so we got through the encounters with minimal effort. Though I was a bit vexed at the end when one of my friends offered to help with an experiment to upgrade my cybernetics and rolled a one. Thank you so much. Please, less help next time. With friends like these, who need GM intrusions? 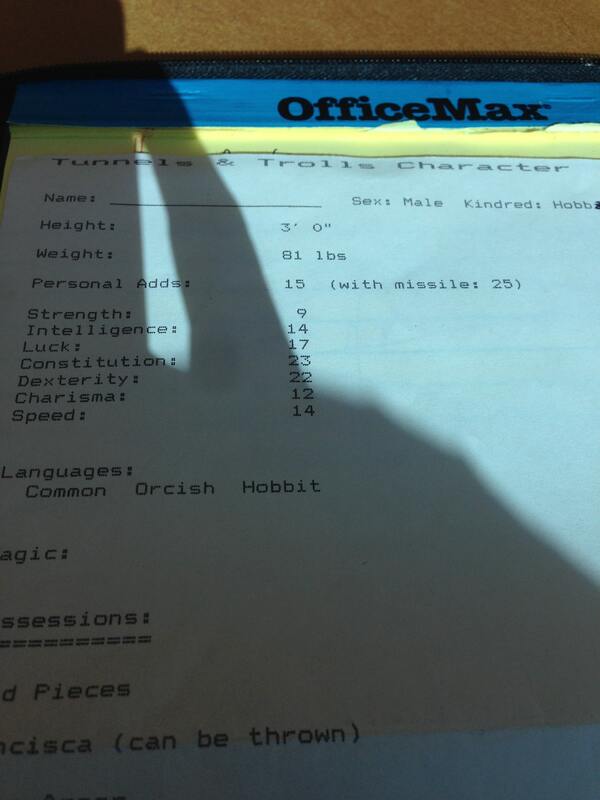 Friday began with pure gaming nostalgia: “Tunnels and Trolls” run by the original developer Ken St. Andre. T&T was one of the earliest competitors to D&D and it was a hoot to play something from another era. By modern standards the game is extremely primitive, but then again there would be no modern RPG without early innovators like T&T. 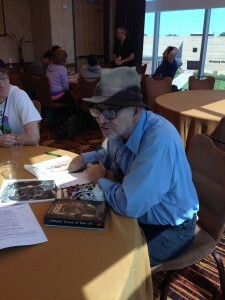 Everyone at the table had tales of playing from a very young age or T&T was their introduction to RPGs. Ken was fun to play with and learning little tidbits like he wrote T&T because D&D was too expensive ($10.00!) cracked me up. The game itself was an escape from a dungeon after our capture. As a Hobb (non-copyright infringing hobbit-like creatures) I tried a glorious parkour maneuver to escape but failed miserably and became a member of the necromancer’s army. That was ok because four out of the six PC died horrible deaths. One of the high points was the pre-generated character I played with. Regardless of the era, gamers never change. I jumped in to a quick game of “Attack Wing” AW is a “Wings of Glory”/“X-Wing” inspired dragon miniature combat game from WOTC. I played it at the “Geeks and Sundry” booth, but sadly there was no Felicia day in attendance. Nor was the “Tabletop” table. I had hoped to play on a Geek Chic table, but it was not in attendance either. I did get to fight beside Teri Litorco from G & S though and the developers were on hand as well. Fun game, but I already own both of the inspirations for this game and feel no need to buy another template movement aerial combat game. The rest of the afternoon disappeared in the vendor hall and will appear in a separate post. Friday wrapped up with “5th Edition Dungeons and Dragons.” I played the “Secret of Sokol Keep” adventure on offer. 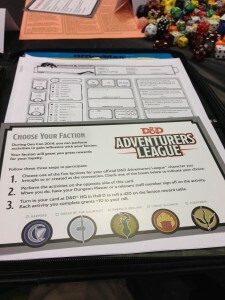 The is part of the organized play campaign (D&D Adventurers League) so the adventure included paperwork to track characters and equipment using a DCI number. As part of the organized play setup, we chose factions (Zhentarims for me, always have to play the evil guys). We used the pre-generated PCs and jumped into an investigation module involving an extinguished lighthouse and an ancient temple with Chthulhu overtones. Story-wise the plot was thin but enough to get the job done. I would call it standard quality for an OP module. Though we had some confusion that made the module much harder than necessary because we asked a question about a specific location and got a “no” answer which should have been “yes.” This sent us off in the wrong direction and slowed down our progress. We actually failed the module because the bad guys got away. Mostly because after the final battle we were trashed and could not stop them. The shellacking the party suffered made me question the power level of the bad guys. I thought it questionable encounter design at best and outright awful design at worst. 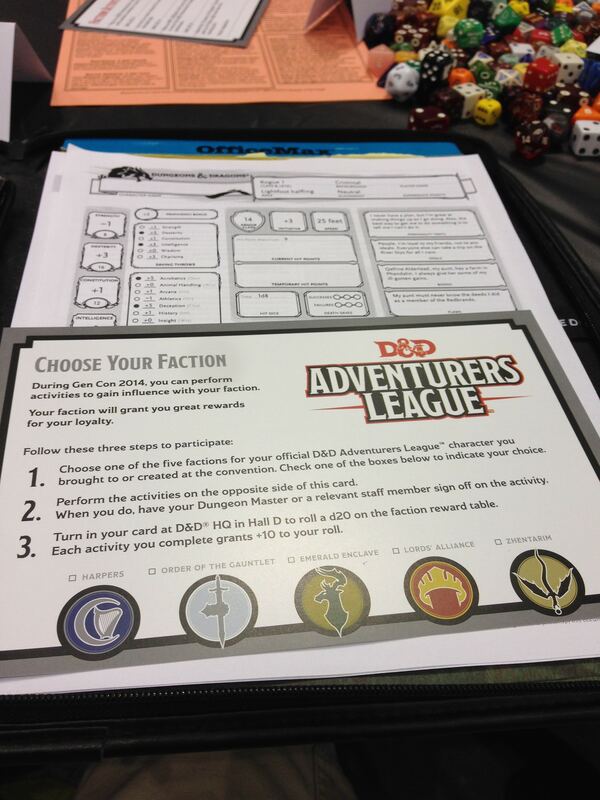 Which brings me to my thoughts on “5th Edition Dungeons and Dragons.” Is 5E better than 4E? Yes. That said, I believe 4E should be eradicated like smallpox, so this is something of a given. A better question is it better than 3.5 or Pathfinder? Again, the answer is yes. Many of the annoying bonuses, math and other minutia that slow a 3.5/Pathfinder game no longer exist. 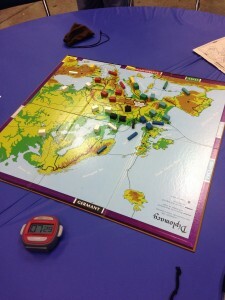 The advantage/disadvantage system was quite good. I did have questions about the math in terms of how big of a statistical penalty the disadvantage mechanic creates, but that is just me being overly analytic. This is the first and last time I will play 5e. The game is fine, but I no longer have the time or inclination to play these rules-heavy games. Though greatly improved, the same tyranny of numbers that drags down encounters, makes creating NPCs a chore and managing high-level PCs still exist. This fact coupled with my total disinterest in WOTCs tired intellectual property (Forgotten Realms….again) means I am not buying in to this edition. WOTC does score points for a nice OP implementation that uses online tracking of adventures and special equipment. Saturday began with “Hickman’s Killer Breakfast.” For those that are not familiar with this event, Tracy Hickman of Dragonlance fame drags seven poor PCs through a dungeon of pain and misery with the sole purpose of making their death entertaining. They die so fast there is a line of contenders to get on the stage for execution. Highlights of HKB included an invasion of Colt’s fans disturbed to discover they are in a hall filled with nerds, Jayne from “Firefly” throwing grenades, Scruffy the janitor from the Futurama, a zombie from Minecraft and a guy that spoke through custom-made fortune cookies. It is hilarious, but there was a musical interlude that poked some spears in to WOTC for letting Dragonlance rot on the vine and basically ignoring the IP. It was goofy fun and I suggest everyone check it out at least once. Saturday afternoon brought my third attempt at “Iron GM.” I competed last year and lost, so here was my chance at redemption. We got an hour to prepare an adventure based on these ingredients. I had something in mind and ran an adventure about a haunting caused by the current ruling empire exterminating a small village on the beach of an ancient caldera centuries ago. Now the ghosts rose to destroy the city and the PCs had to time travel to change history. The PCs time travelled only to discover they inhabited the bodies of some ancient village dwellers (a la Quantum Leap) and had no equipment. They fought the chaos beast first as a warm up and then moved into the village. The PCs tried to stop the slaughter by enlisting the help of a local witch doctor to aid them in this strange land and then a ship entered the harbor with the invading army. Though they did try to bribe and threaten the villagers to leave, Lord Krall and his men would not take no for an answer, so a village meeting was called. The witch doctor (who was actually crazy) wanted the village to die and claimed the PCs were avatars of their god meant to lead them to the afterlife (this mass suicide was the original tragedy that fueled the curse). Betrayed, the PCs rallied in the meeting and convinced the locals to stand and fight. Part of the party used local labor to build defenses (barricades, pit traps, whale oil fires and my personal favorite, an avalanche when you pulled on a rope). It was hopeless. The ship had siege weapons on it, trained and armored marines and years of experience. Defeat was likely. The druid and the rogue tried a desperate move. Sneaking out under cover of darkness they boarded the ship and disabled the siege engines and on the way out used “Warp Wood” to sink the ship! Though the marines swam ashore with minimal equipment, the battle was joined and the PCs emerged victorious. Oddly, for me the funniest part of the game was the druid and his dog animal companion. The dog landed in a body (an extremely attractive female body) during the time travel and I had a good time having the attractive woman do dog-like things. Leg hiking, ear scratching with a leg and licking people. Great fun. 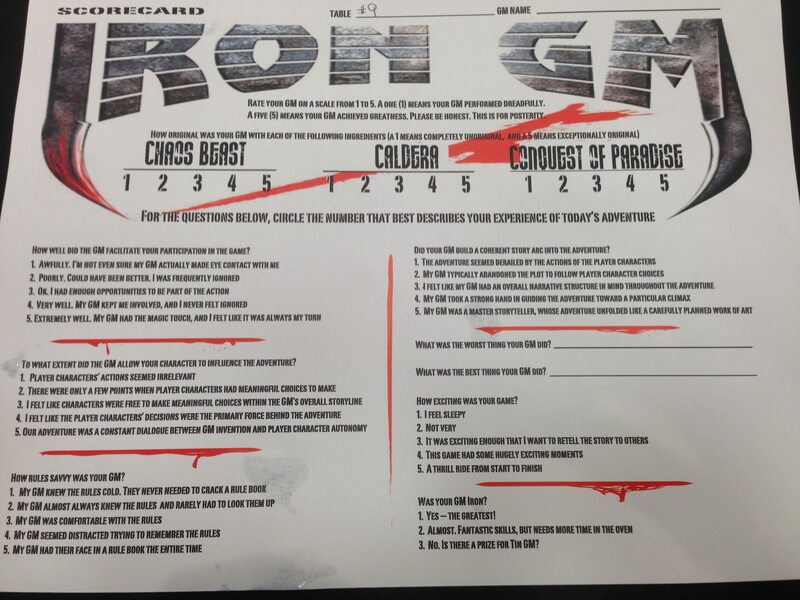 As to the competition, Iron GM is judged by the players. Here is a shot of the judging sheet. I went in with high hopes, but after 15 minutes I knew I was doomed. Four players were great, but the other two were a problem. A middle-aged couple were at the table, the husband was physcially sick and was barely participated the entire game. Even worse, his wife spent the entire session doing something on her phone. 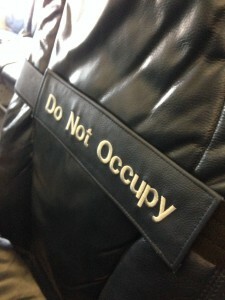 I tried to involve them, but asking direct questions got minimal feedback. Even worse, she was a “Swiss army knife” player that relied on equipment instead of native cleverness. Apparently she never figured out that RPG characters are not defined by their equipment, but by the creativity and intelligence of the player. From what I saw, she came up short on both counts. Such is the reality of Iron GM. Good GMing is a distant second to the luck of the draw on what kind of table you get. My main complaint though is the sheer volume in the room. It was a smaller ballroom and it had 24 tables with GMs trying desperately to energize their players. I lost my voice afterwords and both my players and other tables’ players could barely follow their plots. Fair warning if you try this event, prepare to scream the entire session. Interestingly, you can pick which game system you want to play and Numenera actually ran at a table to great acclaim. I hope to see more of this in future as Numenera is far easier to run with minimal prep than 3.5. Swag was great as usual, but very Pathfinder heavy. Overall, it was fun, but given the lack of feedback from your players preventing you from improving, the loud environment and questionable players I will not compete again. Apologies for the video, the man holding the camera was doubled over with laughter. After some miscellaneous activities Saturday night, I awoke Sunday to Firefly: The Game. I flew around the ‘verse doing jobs, avoiding the Alliance, Reavers and unhappy customers. It is a fun game that borders on an RPG. My cohorts will probably pick it up, but I emerged victorious! Which got me a promo ship and bragging rights. The only problem was I accidentally got Inara the Companion shot dead. Oops. Oh well, it was easier to lose her than Wash. That one still hurts. Damn you Joss Whedon! 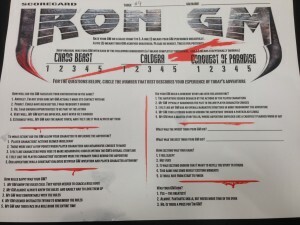 I just wanted to say that your blog about Iron GM from 2013 convinced my husband and I to sign up as players for Iron GM at Gen Con this year. We were the table that chose Numenera because although we were a party of strangers, we agreed we would take any system other than 3.5 and Pathfinder if it was offered to us. When our GM offered Numenera, one member of our table told us he has run it before, so we jumped at the chance to try something new. My husband and I were so blown away by the system, and our GM, that we went out and bought the core book and two supplementary books for the system. And we would never have had the experience if I hadn’t stumbled upon your blog and found out about Iron GM. Thank you!